Alumni and parents across the globe have committed themselves to the important work of volunteering. Each individual contribution is part of what makes Harvard successful. We thank all of our volunteers and formally recognize a portion of those volunteers who have gone above and beyond with special awards. The principal objective of the awarding of the Harvard Medal is to recognize extraordinary service to Harvard University. Extraordinary service can be in as many different areas of University life as can be imagined, including teaching, fundraising, administration, management, generosity, leadership, innovation, and labors in the vineyards. An active member of the Governing Boards, Faculty, or Staff. An individual on the occasion of his or her retirement. If a candidate has previously received an honorary degree, consideration will be given to total service over the years, with principal emphasis on service subsequent to receipt of the honorary degree. Potential receipt of an honorary degree from the University shall be irrelevant in consideration of a nominee for an award. Review of nominations by the Corporation each year will safeguard against a person receiving both honors in the same year. The appointed Chair of the Committee on Alumni Awards, along with the HAA staff liaison, request nominations for the recipients of the Harvard Medal. Email Kate Freed with your suggestions. Nominations received in a given year shall be carried over to the next year automatically. Each nomination shall be reviewed every three years to determine whether it merits continued consideration. The purpose of the HAA Award is to recognize outstanding service to Harvard University through alumni activities and to encourage continued commitment to Harvard in the future. Devoted service may be reflected in significant commitment to a Club, Schools and Scholarships Committee, Class, Fund, or other activity substantially benefiting Harvard University. Alumni of Harvard and Radcliffe Colleges, the graduate schools, and the Extension School who have significantly contributed to the University through alumni activities are eligible. Persons not eligible for the HAA Award include current members of the governing boards, faculty and staff, or deceased persons. Normally persons who have received an honorary degree or the Harvard Medal also will be ineligible. Up to six awards may be made in a given year except in special anniversary years. The awards will be presented at an official meeting of the HAA apart from the Commencement or at another occasion appropriate in light of the particular service of the recipients. For each recipient a citation will be read and an award commemorating the devoted service to Harvard will be bestowed. The appointed Chair of the Committee on Alumni Awards, along with the HAA staff liaison, request nominations for the recipients of the HAA Alumni Award. Nominations received in a given year shall be carried over to the next year automatically. Each nomination shall be reviewed every three years to determine whether it merits continued consideration. 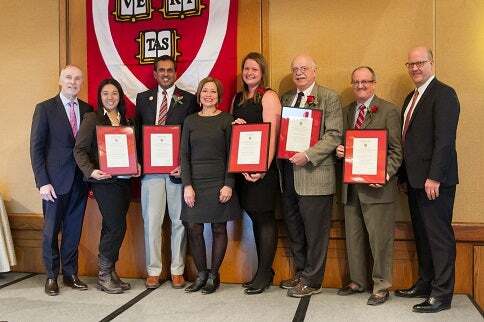 The HAA Clubs & SIGs Committee Awards honor individuals who provide exemplary service to a Harvard Club or Shared Interest Group (SIG), and recognize Clubs and SIGs that have organized exceptional programming. Awards were presented to the following recipients at the HAA Board of Directors’ winter meeting on February 5 at The Charles Hotel. For more than 20 years, Larry Kahn AB ’83 of Orlando, FL has been an active member of the Harvard Club of Central Florida, and on two separate occasions stepped up as president to revitalize the Club. The Club is now thriving with a healthy budget, regular monthly events, and new board members. Larry has been a dedicated member of the HAA Board for many years, serving as a past ALC co-chair and two terms as Director for Eastern Florida and the Islands. As co-chair of the Early College Awareness Program, he has expanded the program and is a tireless ambassador for promoting this worthy initiative to other club leaders. Walter L. Keats AB ’67 of Chicago, IL has been a dedicated member of the Harvard Club of Chicago since he joined upon graduation in 1967. For the past three decades, Walter has overseen the orientation and onboarding of newly elected presidents, officers and directors of the Club, and has served as the administrative backbone of this vibrant organization. He has also acted as the club historian, collecting records for the club archives that resulted in the publication of a 198-page book detailing the history of the HCC on its 150th anniversary, and collaborating with Blair Kamin, Nieman Fellow '13, in 2014 to organize a campaign to fund a restoration project of the Johnston Gate—the first, largest, and most elaborate of Harvard Yard’s 26 portals, and the only portal with an HCC connection. Acey Welch AB ’53 of Concord, MA has a long record of hard work, motivation, and commitment to the alumni community. For over two decades, Acey worked with her Radcliffe classmates, and then with a cohort of other Radcliffe alumnae, to found and lead the Committee for the Equality of Women at Harvard (CEWH), a group of 2000 alumnae and alumni dedicated to increasing the number of tenured women faculty at Harvard. In 2013, Acey envisioned and created a new HAA Shared Interested Group, the Alumnae/Alumni Network for Harvard Women (ANHW), a vibrant intergenerational community of Harvard and Radcliffe alumni/ae designed to increase and strengthen Harvard women’s presence, voices, and leadership within Harvard and the larger society. Under her leadership, ANHW now has chapters in Boston, New York, and Washington, D.C., and has organized many public lectures. Acey, and ANHW, also played an integral role in developing Harvard’s inaugural Women’s Weekend, which took place this past fall. Since its founding in 1961, the Harvard Club of Australia has dedicated itself to the mission of furthering learned exchange between Australia and Harvard. Its myriad scholarship programs fund nine post-graduate students at various Harvard schools and programs every year. Its Australia-Harvard Fellowship reinforces existing academic networks at mid-career and senior levels, with substantial impacts on scientific discovery and career advancement. The Club’s focus on building connections amongst alumni includes a robust calendar of social, intellectual, and cultural events; a vibrant mentoring program for Harvard graduates returning to Australia; and a focus on developing a strong Council that encourages all members to take a leadership role. As a result of their engagement efforts, the Club has doubled its paid membership in the past seven years to over 500 active members. The Harvard Club of Seattle is a dynamic organization with selfless and dedicated leadership. Over the past five years, the Club has more than doubled its membership to approximately 500 and doubled their events to more than 45 per year. The Club has expanded their public service activities to include regular public service events, participation in the Early College Awareness program, and a January term public service internship program for Harvard College students. In addition, they have created a mentorship program, in which students learn about career opportunities during the January term. As it marks its 125th anniversary, the Club is strong, vibrant, and poised for continued success. The First Generation Harvard Alumni, created during the 2011–2012 academic year with the express mission of improving the experience of Harvard students who are the first generation of their families to attend a four-year U.S. university, FGHA has built a membership of approximately 400 with an active board of over 30 individuals. In the past 4 years, FGHA has established a groundbreaking mentorship program, developed on and off campus programs for students and alumni, and worked with Harvard’s Office of Career Services to conduct career panels. FGHA has supported students in establishing the First Generation Student Union and assisted the student group with winning official recognition from the College. FGHA has worked tirelessly to raise awareness of First Generation issues, and their efforts have made a tremendous impact in the lives of Harvard students and alumni.